At the end of 1944, the unstoppable offensive of the Red Army forced the Nazi authorities in Auschwitz to prepare to abandon the compound and order the destruction of all the evidence of the crimes they had perpetrated. Rows of barracks in Auschwitz-Birkenau after the liberation. © Auschwitz-Birkenau State Museum. After getting rid of all documentation and a great part of the camp facilities, on January 17-21, the prisoners still able to walk were forced to trek towards the inner Reich in what were known as death marches. The few of them that did not perish on the journey were relocated to other camps. 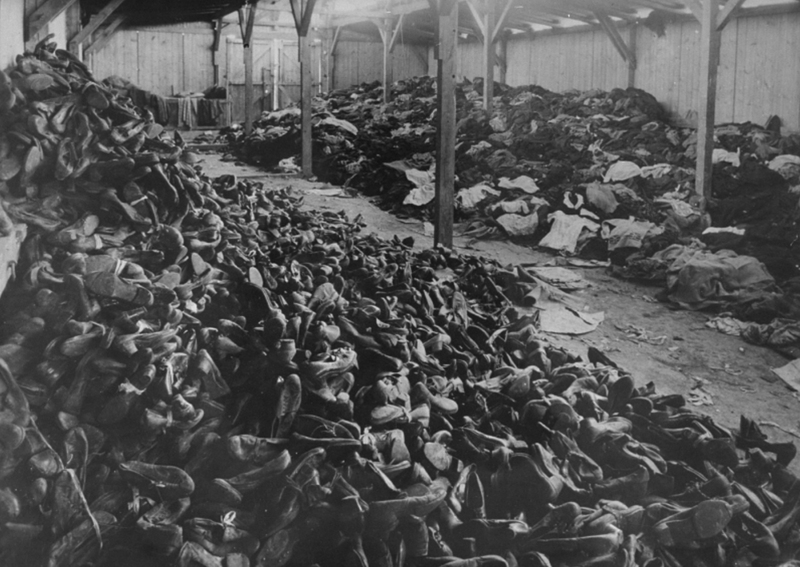 Even though, Soviet troops found at their arrival, on January 27, 1945, plenty of irrefutable evidences of the mass extermination carried on in Auschwitz, such as mountains of unburied bodies or the victims’ belongings–thousands of men’s suits and women’s dresses and, among other things, 6,500 kilos of human hair ready to be sold in Germany. 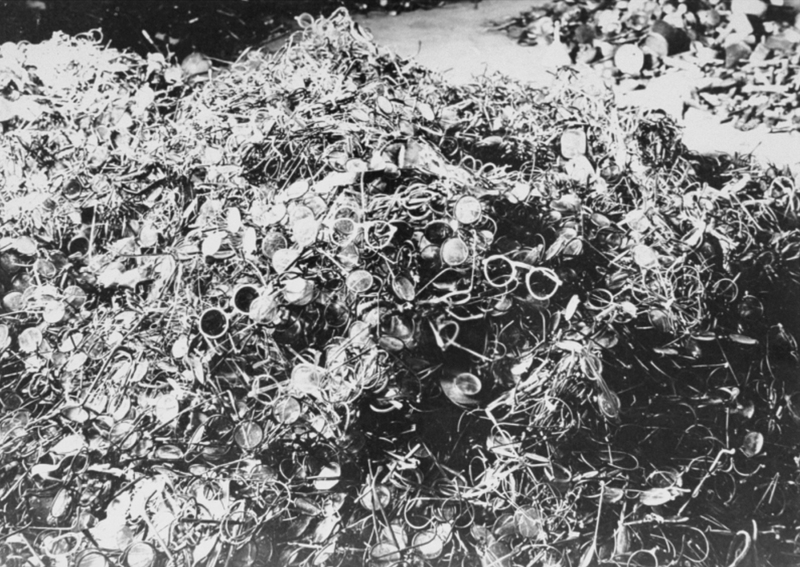 Some of the evidences of the deliberate murdering found in the camp after its liberation–mountains of glasses and shoes stolen to the prisoners. Left: © Wiener Library. Right: Courtesy of USHMM. They also found almost 7,000 people, exhausted and sick, in the compound. Despite the efforts made by the Allied troops and doctors, more than a half of them would die within days of having been liberated. 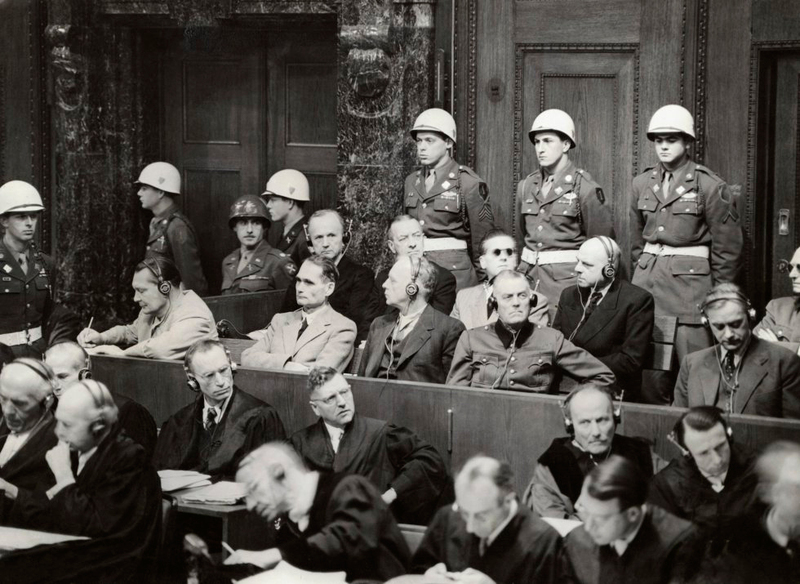 The world had to wait until November 20, 1945 for the Nuremberg trials to take place, in which eight Hitlerian associations and 24 Nazi leaders were judged for the crimes and atrocities they had committed. Twelve of those prominent Nazis were sentenced to death. Most admitted having perpetrated the crimes they were accused of, although barely three of them showed regret. The highest authority of the Nazi state, Adolf Hitler, was not present. As many of his nearest collaborators, he had killed himself during the death rattle of World War II. Defendants in the main Nuremberg trial. From left to right, front row first, Göring, Hess, Ribbentrop, Keitel, Dönitz, Raeder, Schirach and Sauckel. Courtesy of National Archives and Records Administration.